The most expensive diamond necklace in the world is stolen during a charity gala in London. 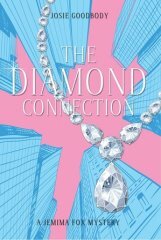 Jemima Fox-Pearl, Head of PR at fine jewellery house Vogel, travels the world in a bid to solve the crime, while unravelling a century-old mystery of the Cullinan Diamond's fabled missing part. Josie Goodbody grew up in Dorset, studied French Literature and Language at Exeter University and after a year in the Paris fashion industry moved to London where she worked for over a decade in Public Relations for international luxury brands including Graff Diamonds.